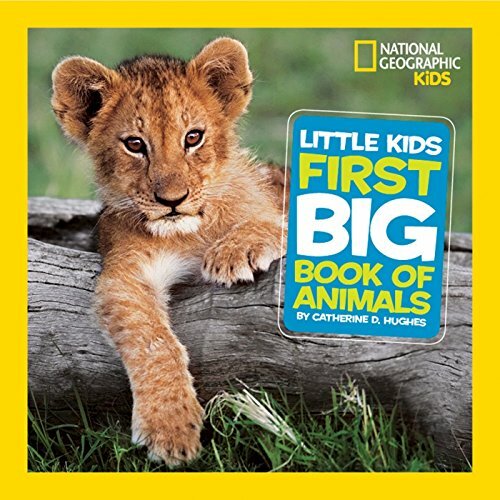 National Geographic Little Kids First Big Book of Animals is a wonderful animal reference that will delight children and will entertain them for years to come. Inspired by the National Geographic Little Kids magazine comes an exhilarating new reference book for children between the ages of 4–8. It is a 128-page book filled with various types of information about some well-known animals of the world and some more obscure ones as well. The table of contents is broken down by habitat plus a few of the animals that live in that particular habitat. It is an easy guide to help readers find their way through the pages. Each spread is filled with wonderful up-close photographs of animals and their babies in their natural habitat. What was an excellent addition to this book was the Facts section on each page. Each Facts section includes: kind of animal, where it lives, the size of the animal, the types of food it eats, the sounds it makes, and how many babies the animal typically has. Children will find this information really interesting, as well as the facts about some of the various species of certain animals. The added pictures help compare the different species so the reader can see the differences or similarities. The text is simple enough not to be intimidating. Children and parents will love the section in the back of the book that includes parent tips for extending the reader’s experience beyond the pages of the book. The activities relate to majority of the animals, helping children picture themselves in that animal’s world. An animal map in the back of the book color codes each continent, showing the reader where each animal discussed can be found. There is also a glossary and an index. The only quibble was that not all babies of the animals were shown, or all the names of what they were called. With majority of the animals in the book shown taking care of their young, and how the baby animals grow and change, this felt like a misstep in the text. Overall, this book is well developed, bringing many helpful textual and informational features to the younger age group, keeping them fascinated with animals and the world around them. Elementary-age children will enjoy this hardcover book and will learn a ton.